The show was aired online last night (about 12 hours ago) and I worked on it for a few hours this morning, originally for Animesuki. I’ve left out the opening and the ending, so this only covers from about edit: 06:30 04:00 to 35:00 of a 38 minute long show. The first part is just Amamiya and Minase asking Aoki questions. After an interlude where they decide Aoki’s Vers name, the second part has him answering a couple of questions sent in by viewers. Amamiya: We look forward to speaking with you today. Amamiya: Am I still alive? Aoki: The finale…well, I’m assuming you’ve watched it, I…tried making it easy to pick up on things…but I guess that wasn’t the case? Amamiya: I felt that…it left us with a lot of riddles. Minase: Maybe I should ask this first…was I taken into custody? Aoki: At the end, huh? Yeah. Minase: Ah…ok, I just wanted to confirm that. Ah…so that means that, for both of us, our well-being is in doubt. Amamiya: Yeah…I really want to know! Minase: Same! Well, I’m sure there’s a lot we want to ask, but first, let’s recap the series together. Amamiya: We’re reached the end of the first series, so congratulations (thank you for putting in so much work into this). Amamiya: Please tell us how you feel at this point. Aoki: Well, having broadcast the finale of the first cour, it’s like we’ve cleared the first stage. But since we’re starting work on the second cour – we may not be recording at the moment, but I’m in the midst of preparing for the second cour. Minase: Oh…so that’s how it is! For us, since we’re not recording, it feels like a while since we’ve seen each other. Amamiya: So you’re steadily working on it! Does that mean that the plot ahead has basically been decided? Aoki: Yes. Most of it has been. We’ll be starting the dubbing again soon. Minase: Does that mean that you’ve already started drawing out that ending in your head? Or perhaps you’ve finished it? Aoki: Well, yes, you could say that we know how it will end. Amamiya: Waaah!! Like, my heart just skipped-a-beat hearing that! Minase: I can’t wait to see it. Amamiya: Yeah, I really want to ask about it now! Amamiya: What was the original concept around which the show was made? Aoki: Aniplex producer Iwakami first proposed it to us. Urobuchi Gen-san, Iwakami-san, and I decided to make a mecha anime together. That was about 2-3 years ago…probably around the time I was doing Fate/Zero. It was a while before we came up with the broad basis for the story. In the beginning, the story was completely different, but the first thing we decided on was that it’d be a story about ‘strong vs. weak robots’. The story was decided based around this concept. Amamiya: Out of the three main characters, which one crystallised first? Aoki: Hm…I’d say they all came into being around the same time, but if you want to be really precise, then you could say Slaine was first. Though they weren’t even named at that point, just labelled ‘main character A, B and C’. The character that became Slaine was the first one that was completed, so-to-speak. Minase: The final episode was pretty shocking to many people. Was that decided early on? Aoki: Urobuchi-san made the original story outline, upon which all the scripts were based. That foundation has been protected, but a lot of things have been added to it — stories, characters and details. And we’d make adjustments based on those additions. Amamiya: So Inaho and Asseylum having fallen in that final episode, was that also in the original story outline? Aoki: No, it was slightly different. Aoki: The story has remained the same, but the route we are taking is different. Minase: Waaah…I’m really curious about the route you didn’t take! Amamiya: Yeah, I really want to ask about that! Minase: Right? Ah, and also, we looked at the character concepts from the first BD last week, and Inaho’s character struck us as being rather different from what he is now. Like, there are a few drawings of him smiling. Does that mean that even character expressions were amongst the details that you added or took away? Aoki: Back when Shimura-san created those character design concepts, he was a bit ‘softer’, so-to-speak. But we were still finalising his character at that point. The basic idea was there – a smart and quick-witted kid, someone calm and collected; the question of just how ‘calm and collected’ was still up in the air. So Shimura-san’s original character designs had a good balance. In the end, he became a character who’s emotions don’t really show on his face, so his design was modified based on that. Amamiya: In terms of character settings, has Inaho always been like this? Aoki: It’s in the show (really…? –karice) but Inaho lost his parents during Heaven’s Fall 15 years ago. Since then, he’s been living with his sister, Yuki — with a lot of help from the people around them, of course, but basically, it’s been the two of them. And even though they had support, I’d say their life has been pretty difficult. So in the course of supporting each other through this, like, ‘the wisdom of living’ and the attitude of never giving up no matter how tough things get, that’s probably how those traits that Inaho has came to be. Minase: Like how he was looking out for food specials (in the first episode). That kind of ‘wisdom of living’ is what has helped them overcome all the challenges they’ve had. Amamiya: It’s a good thing that Yuki isn’t the same though, isn’t it? Minase: Perhaps that’s why she’s like that though, because she has a brother like that. I really really like her. Amamiya: And the trust between them is also the result of them having worked together to get to this point. Aoki: Right on. In supporting each other, each filling in for what the other lacks, that’s how each of their personalities have taken shape. Minase & Amamiya: Wow, that’s fantastic…really love them as siblings, huh? Minase: And now for the topic that the two of us are most interested in…Slaine… what should we start with? Amamiya: Slaine…well, I’m personally really curious about his past, like his father and so on. Like, what happened before he crash-landed into the ‘bath house’ and was saved by Asseylum. Aoki: Slaine’s father was a researcher studying Aldnoah (NB: the word used indicates that he was the ‘doctorate-holding’ Dr, not an MD). At the end of episode 5, Saazbaum mentioned a “Dr Troyard,” right? Dr Troyard was invited/called to Vers to conduct research on Aldnoah. On the way, their vehicle malfunctioned and so they crash landed. And that’s how Slaine and Asseylum met. Amamiya: Does that mean that they’d always lived on Earth before then? Aoki: Yup, Slaine lived on Earth for quite a long time. Amamiya: And his father was from Vers? Amamiya: And…well, going completely off on a different tangent, does Slaine have any hobbies? Amamiya: Since the anime probably won’t cover this sort of thing…? Aoki: Well, the food will appear in the manga… (Both are very excited) Like, a bit more of his personality will become clear, as will his relationship with his father. 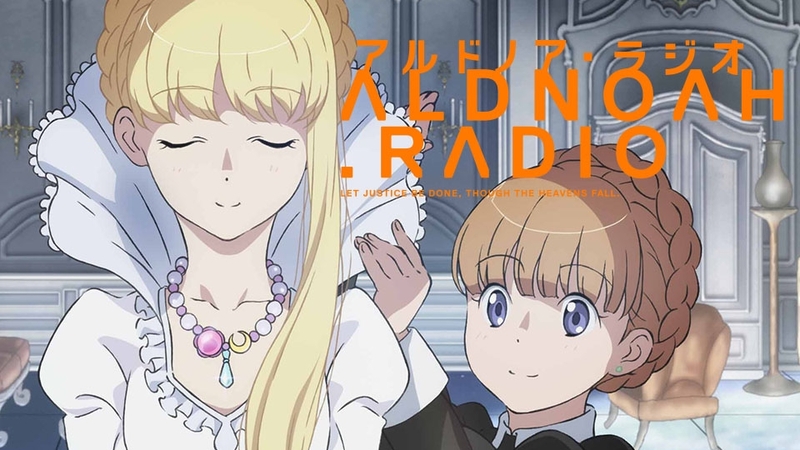 Amamiya: And coming now to Asseylum, in the world of Aldnoah.Zero, she’s like a light. But we don’t really know much about her…she’s lost her father, right? In Heaven’s Fall. And her grandfather is the current ruler. Does she have a mother? Aoki: Her mother passed away pretty soon after she was born. Minase: So, Asseylum has been alone, except for her grandfather, pretty much since she was a baby. Aoki: She doesn’t really speak about her father in the show, right? Or her family? She does talk about her grandfather, but she probably has no memory at all of her father. Amamiya: Because she was so young, she really has no memory of her parents. That’s really sad. Would she have played with her grandfather? Aoki: Well, she interacted with him. Remember the formal photo we made for promotional purposes, the one with Slaine as well? Amamiya: And did they get along? Aoki: I’d say so. From both sides. And remember in episode 5, how he remembered Slaine? So I think they got along very well when she was young. Minase: Moving on again…can I ask what you think of Eddelrittuo? Like, I’ve been wondering about her past, about when she first became a ‘lady-in-waiting’, and when she was first attached to the princess etc etc. Aoki: Well…Eddelrittuo is going to be covered in the manga – like their meeting and stuff. Minase & Amamiya: (Excited reactions, though ‘nervous’). But she’s a good kid, right? Aoki: Yes, she is. Actually, she’s also changed a lot from how we first envisioned her. She was actually around 20yo at first. (Wha– Really?!) As the princess’s companion, we set her up as being older and we even had Shimura-san design her based on that concept. But as we got a bit further in development, we felt that the story progression would work better if she was younger, and that’s how she came to be. And we apologised to Shimura-san and asked her to redesign her after that. Amamiya: Ah, so she was originally an older-sister figure. Minase: And if she’d been 20, I probably wouldn’t be voicing her! Amamiya: Ah, good point! Someone else would probably be playing her! Amamiya: It’s in the character design concepts, right? Minase: Ah, yes! But perhaps, in the anime too, someday? Minase & Amamiya: Since you’re like the father of this show => maybe Aldnoah Ei. What would you like? Aoki: Is this something that I decide? Minase & Amamiya: Or Aoki Zero, or Aoki Rei. Aoki Zero is pretty stylish… Is there anything that strikes a chord with you? (Aoki laughs) How about we flip it? Zero Aoki, or Zero Aoki Ei? Which would you like? Aoki (laughing): Out of which options?! Amamiya: Director Aldnoah Ei, Director Aoki Zero or Director Aoki Rei. Aoki: Then let’s go with ‘Rei’. Are there any settings or plot developments that you’ve decided not to go with? I’d like to rewatch the series with any such details in mind. (Minase & Amamiya agree with the sentiment). Aoki: Well, there are quite a few. For example, since this is a mecha anime, there are quite a few ideas for robot abilities that didn’t really fit in. Amamiya: Does that mean they won’t appear at all? Aoki: Well, I’d like to try to include them in S2. Minase: Can we ask what some of those might be? Minase & Amamiya: then we’d better leave it here. Is there anything else? Something that you can share in greater detail? Aoki: Well…turning to the characters, Marito is also different from what we envisioned at the start. In episode 7, at the very end Rayet finished Feminanne off, right? (Yes) That was originally meant to be Marito. Minase & Amamiya: So he was meant to get back into the fights there? But it changed to Rayet. Amamiya: Ah, so just a word from the producer, there wasn’t a deeper meaning behind it? Like, Having him fight later? Aoki: Well, no. I asked him, “wouldn’t it be fine leaving it as Marito?” Though Rayet too worked — both were ok in terms of the story. But it ended up being Rayet in the end. Aoki: Another one is actually Slaine. Aoki: Slaine was originally meant to be a bit more…ambitious. The basic background is the same: he’s from Earth but went to Vers and is oppressed/mistreated there. The current Slaine, the one in the series, well, his spirit has been broken because of this mistreatment, right? Like, he’s struggling with it; even when he tries to go against it, it doesn’t work out well for him, so that’s broken his spirit. The one thing that keeps him going is Asseylum. But at the start, he was someone who took whatever happened and it…you could say he had a rebellious spirit. But that didn’t really work out, and we figured that actually, his character would actually work better if he were someone whose spirit had been broken. So we changed quite a few things at that point. After watching that final episode, I really don’t know how I’m going to wait 3 months! So, without giving away any spoilers, could you please share with us a little about the second cour? Aoki: Well, this week, a preview for the second cour was released. If you listen to it, you should get an idea (of what happens next). Minase: But even then, we don’t really know how we should take it. Amamiya: Well, then we’re going to have to watch it over and over again. Minase: Maybe some of the viewers have already picked up on it. For us, we don’t really know what to pay attention to, huh? Minase: Ah, so her death isn’t confirmed. So you can hold your head high. Aoki: Well, we don’t know whether she’s alive or dead. Amamiya: So if she’s alive, then how will she come back into the story? or something like that? Aoki: Also, the person narrating is Yuki, right? That’s also a hint. Minase: Ah, and ‘Inaho’ hasn’t popped up in this conversation at all yet, so about Inaho…does that mean he’s definitely…? Minase & Amamiya: and quite a lot of it. Amamiya: Like…try a bit harder to miss, please! Minase & Amamiya: (nervous laughter) That’s true. Ah…it’s nerve wrecking. Aoki: Well…so given the situation, given those conditions, he will die. I heard it from you that is going to have a radio show, I wasn’t expecting that you are going to translate it. Thank you very much. It was very entertained but they conceived very well the spoilers for S2. It was very interesting the background of Slaine, Asseylum and Inaho. Sounds like if the princess dies, it will be the end of Vers empire. Don’t forget to buy the manga to learn more. Actually, I hadn’t planned on translating it either — I was in the middle of it before I even realised what I was doing! I did find it really interesting myself. And yeah, Aoki’s pretty good at being secretive about his plans, huh? As for the manga…well, the manga they’re talking about is stuff that comes with the BD releases, and I really can’t afford those at the moment! I’m debating about the radio CD that came out last week though! (1) In that situation, under those circumstances, he will die. (2) The situation he was in, if he’s left like that, he will die. If you listen to it, the pause is really ambiguous about which of these it is. I’m not sure there’s any way to reproduce that ambguity in English, so I just left it as (1), with Amamiya and Minase’s subsequent comments representing it, in a way. Well, don’t you think that ”under those circumstances” means ”if he’s left like that”? The ambiguity can be reproduced by putting period next to each word, meaning there’s a longer pause between the senteces. The three dots (…) can also be used to express that he meant something else or something more. The last thing is putting his expressions into brackets for e.x if you listened to him smiling , you can write (smiled) or smiled. These are the only methods that I know to express the ambiguity in English. However, even then it would be difficult to know what he had in his minds when saying that. Anyway your last sentence , is confusing to me. Sorry, I’m too stupid 😛 or maybe I can’t really think too much, right now. So what do you mean by that sentence? Well, don’t you think that ”under those circumstances” means ”if he’s left like that”? You might notice that the first phrase of the two options I’ve given is also different. Basically, the difference between them is that, in the first option, both “in that situation” and “under those circumstances” are referring to the same thing: the state that Inaho is in; in the second option, he’s basically saying that “The way he was when we left him, if he’s left like that…” The first option suggests that Inaho’s death is certain, whilst the second option leaves room for his survival, if he’s found and treated quickly. How do I represent these two possible interpretations of what Aoki said? I looked up some statistics a while back: apparently, between 50-60% of people who are shot in the head survive. If the bullet penetrates, then the survival rate is much lower (something like 5%), but most bullets actually don’t penetrate – in fact a lot of those who die succumb to blood loss and other complications. The skull is the hardest bone in the body, and it’s built specifically to protect one of the most important organs; but there are a lot of blood vessels in the sculp, so if there’s a deep or wide wound, it can be pretty dangerous. As for the ‘famous young girl in the news’: I’m referring to Malala Yousafzai, who was shot in the head/face two years ago; she’s been awarded the Nobel Prize for Peace. ”if he’s found and treated quickly”? Well, that’ s a bit discouraging, because there weren’t anyone left to help him quickly, were there? Well, that’ s a bit discouraging, because there weren’t anyone left to help him quickly, were there? Yuki and Inko. I think he’d have a chance if they get to him within a few minutes. The bullet actually hit Inaho in the hardest part of the skull — the forehead. It’d have to be a pretty powerful gun if the round penetrated the bone there. To me, that just means that I’m not going to complain that it’s unrealistic if he survives. Of course, it’s also not unrealistic if he dies — as you said, it’s down to luck (and treatment). I see that you did your homework, so you also think that Inaho is alive. The princess is probably alive and lost her memory and Slaine will hired her from outside world. Inaho will find her because he is in love with her and will help her make the peace. PS: I see that you tried the black BK burger, lol.